What a magical, mesmerising and eccentrically beautiful Cinderella Alexei Ratmansky has created for the Australian Ballet. I have to admit to goose bumps on many occasions so thrilling was the storytelling, the choreography, the scenic design and the performance. The story we know so well is intact in its outlines but Ratmansky has made the work his own, and boldly so. The clues we get to the era in which this ballet is set come largely from the set and costumes by Jérôme Kaplan and from the projection design by Wendall K. Harrington. With their references to surrealist artists such as Salvador Dali and Giorgio de Chirico, and even perhaps to a Dada film, Fernand Leger’s Ballet mécanique, and the Bauhaus work by Oskar Schlemmer, Triadic Ballet, we can place this Cinderella in the 1920s or 1930s. But the universality and theatricality of the visual elements, including the Act I setting of a proscenium arch within the theatre’s own proscenium arch, put it into an era beyond eras. As Cinderella, Leanne Stojmenov brought a range of emotions to the role. She was lost in dreams as she danced alone while the Stepsisters readied themselves for the Prince’s ball; full of sadness when the Stepmother slashed the portrait of her now dead mother; caring as she welcomed the somewhat outlandish Fairy Godmother into her home; shy as she tried out dance steps at the ball; pensive as she wondered whether she would meet the Prince again; and ultimately joyous as she danced the final pas de deux with him. It was a finely sculpted performance. As the Prince, Daniel Gaudiello also presented us with a well-defined character with a strong personality. Dressed stylishly in a white suit he was the man in charge as he interacted with his guests and as he travelled the world seeking the owner of the slipper left behind at the ball. On this world tour we saw some of Gaudiello’s best dancing. A series of grands pirouettes finishing with multiple turns was beautifully executed. And what a spectacular exit he made as he left the stage at the end of that scene. But with his Cinderella he was a different man, much less hard-edged. And the final pas de deux is such a glorious piece of choreography. Two two bodies move together as one, bending and twisting, making complementary lines with arms and legs, and finishing so softly and gently. At times the choreography was surprising as is so often the case with Ratmansky. Feet, arms, upper bodies, everything really, moved in unexpected ways. A pirouette had the foot at the cou de pied position, a cabriole appeared from nowhere, bodies bent forward when one expected them to bend back. And Ratmansky is a master at telling the story, creating a character, and giving clues to and motifs for future moments in the story through choreographic and dramatic methods. I wondered why the Fairy Godmother, played with style by Lynette Wills wearing a kind of bowler hat, long dark clothing and black glasses, disappeared into the grandfather clock in Cinderella’s house. But it became clear later. And the beautiful swirl of black-caped figures, holding Roman numerals and circling the stage as the Fairy Godmother advised Cinderella to leave the ball at midnight, was also reprised in a surprising way later. There were some wonderful performances from others in the cast. Ingrid Gow and Hailana Hills as the Skinny Stepsister and the Dumpy Stepsister respectively had some hilarious moments, as did Amy Harris as the rather vindictive Stepmother. I also admired the performances of the celestial bodies who transport Cinderella to the ball (no pumpkin coach in this production), although it was hard to identify the dancers from where I was sitting and another viewing is needed to match some of the various planets represented with their costumes. As for the scenic transformations, they were astonishing, breathtaking. It was not only the surprise they generated when they happened, but also the way the lighting by Rachel Burke was used to enhance every transformation, as well as the spectacular use of fabric of various kinds to assist the transformations—in fact the use of diverse fabric textures throughout the ballet in costuming and elsewhere gave us yet another magnificent scenic element. And musically, I have never heard the Prokofiev score sound so clear and so distinctive. Without wanting to take away from the orchestral playing, Ratmansky’s choreography is so attuned to the music that it adds a visual element to the sounds that allows me at least to hear the music differently. I look forward to seeing this remarkable work again during the Sydney season. Let’s hope it remains in the repertoire for a long time to come. It is sheer magic, brilliantly conceived, and a truly immersive experience. All hail Ratmansky and his team. For my comments after a second viewing in Sydney follow this link. See also my comments on David Hallberg’s performance as the Prince published by DanceTabs. unfortunately I was not able to see the performance, but I love Ratmanskij’s choreographies very much. In my opinion there never are “flat” moments in his ballets and I love the way in which he let the dancers’ identity emerge even when they dance non contemporary roles. I hope to see it sooner or later. Elisabetta, Cinderella opens in Sydney in November. Perhaps you can catch it there? I hope it won’t suffer too much from being transferred to a different stage, but if you are a Ratmansky fan it is not to be missed. I suspect tickets will sell fast though. There is so much more to say about Cinderella but I am wary of putting in too many ‘spoilers’ at this early stage in the season. Suffice it to say that there are definitely no flat moments! And now that I have seen several of Ratmansky’s ballets, I am impressed with his versatility, in particular his ability to create full-length narrative works and as well shorter, more abstract pieces. I will try to attend the performance in November, it would be really exciting. Have you ever seen his revival of Soviet ballets, such as “The Flames of Paris”? Not The Flames of Paris unfortunately. I was lucky enough, however, to catch The Bright Stream in Brisbane earlier this year. Like Cinderella, there was always something interesting happening I thought! I’m going to divide my posts by bouquets & brick bats. I loved Leanne Stojmenov. The solos and pas de deux were all excellent and technically at the level I’ve come to expect from AB. The choreography was definitely never flat but that’s the end of the bouquets! Despite the references you have made to Dali, I have found the scenic backdrops in both Cinderella & La Sylphide disappointing. They were childish not childlike and I came away remarking that, if the purpose was to invoke the revitalising spirit of de Diaghilev, they failed. I thought the details of the storyline smacked of shallow political correctness with the “stab” at fashion in the second act and the ridiculous feminist excuse for the wickedness of the stepmother in Act 1. Sorry, she is just wicked, Cinderella’s father shouldn’t wear the blame (perhaps the funding came during the Gillard interlude). That brings me to the costumes. Those satin suits the girls in the corps de ballet wore at the ball were, frankly, horrible and the concurrent dress coats on the men were anachronistic and, for me, that scene went down like a lead balloon. I didn’t like the fairy godmother depiction either, but that’s just taste maybe even being picky and I’d live with it if the rest of the production was up to scratch. While the choreography was never flat it was also a bit of a jumble, perhaps reflecting Ratmansky’s own life. So, overall, it wasn’t the inspiring performance that would drive me to spend as much as I do to see AB. If I lived in Sydney or Melbourne, it would be as good a night out as most – no more, no less. Thank you, Louise, for your forthright comment. In reply, first of all I want to reiterate how much I have enjoyed watching Leanne Stojmenov over the past several months. She seems to have at last fulfilled the promise that I thought was there way back when she first joined West Australian Ballet, aged about 18. I think that she has grown in maturity as far as her dramatic abilities are concerned just recently – the technique has always been there. As for your comments on Ratmansky, I was far from a fan of his work after his Scuola di ballo of 2009. I disliked it intensely for many of the reasons you outline in your comment, and in fact I probably felt quite angry. But, after seeing his Seven Sonatas for ABT in 2011, I have become hungry to see more of his work. I love the surprise I so often feel when watching his choreography and in the case of Cinderella I enjoyed his very different take on an old story. As you know I liked the design: I thought it suited the way Ratmansky had approached the work and I loved seeing something different from tutus and tiaras. So we will have to agree to differ and perhaps other readers of this site will have comments here. But you also raise the issue of the nature of the Australian Ballet as a national touring company. I too spend a fortune on air fares, ground transportation, accommodation, meals, a Sydney subscription, one-off tickets for shows elsewhere, and so forth in order to see performances. Like Perth, Canberra gets a visit only very occasionally, which annoyingly has not always been the case. Unlike Perth, Canberra is situated half way between Sydney and Melbourne so the distance factor doesn’t really apply. I can’t imagine the current Cinderella fitting on stages smaller than Melbourne (even the Sydney Opera House, but I hope to be surprised), but cities like Perth and Canberra (others too) should not be cast aside as they are by a company that purports to be a national company and whose brief has always been that of a touring company. 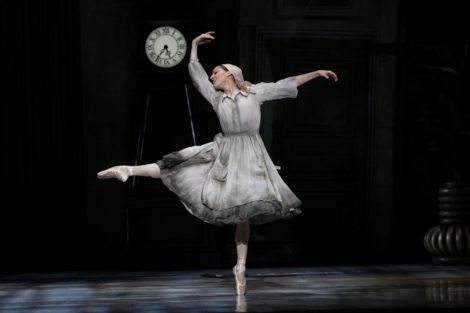 I think that we outside Sydney and Melbourne will always have to travel to see some shows and there will always be some we like and some we don’t —I disliked intensely the recent La sylphide and longed for a bit of the Gielgud touch to make it look the way it should. But I do think that the Australian Ballet is failing to address the issue of other cities and I think there are ways to handle the situation that haven’t been properly explored. Agree with your further comments entirely, including the effect of taste on those things you mentioned and I understood the need to make the ball costumes obviously different for the change to be effective but those particular costumes just didn’t work alongside the men’s, for me and I didn’t think the addition to the story added anything. Just opinion. Opinion is good and I am happy to be able to provide a space for opinions that are contrary to mine! Unfortunately I didn’t get to Perth for WAB’s Sylphide but it is good to hear that they are looking good. I did have the opportunity though, some years ago now, to watch Dinna Bjorn work with dancers of the Royal Danish Ballet on La sylphide and then to see that company dance it, so I was frozen with horror at my recent experience with the Australian Ballet’s production. We saw Cinderella at the Opera House last night. Leanne Stojmenov was excellent as Cinderella, but I really did not enjoy the other aspects of the production at all. Far too much emphasis on the art deco for my taste. Costumes (garish one minute, drab the next), tacky lighting/projection effects, extended and often overly busy choreography which (IMO) didn’t sit well with the Prokofiev score. I suspect this was all intentional by Mr Ratmansky, but it didn’t appeal to me at all. Whereas I enjoy Graeme Murphy’s works, this was too far out of my comfort zone to enjoy. Thank you for your comments. I have been wondering how the production would stand up in Sydney on a smaller stage and am now wondering whether it suffers somewhat from being crammed up. I will see for myself shortly and am planning a second post after a Sydney viewing. However, if you don’t like the art deco emphasis or the relationship between the choreography and the score space will not be the issue. You have made me more curious to see what it looks like in Sydney.